A gleam in his eye, laughter in his voice, and a contagious smile best describes our 14-year old son Rhett, who was a gregarious, boisterous, compassionate teenager until he was ripped from our lives when myocarditis took his life in the early morning hours of Wednesday the May 15, 2013, shattering our hearts in a million pieces. Tuesday May 14th began and ended as any typical weekday. Unbeknownst to me 11:00 PM that night would be the last time I would see my son alive when he gave me a hug and kiss and got ready for bed. Rhett arrived home from school that afternoon excited and nervous about his second interview for his first summer job as a pool attendant working for the city. He returned from the interview excitedly announcing that he got the job just as soon as he passed the drug test scheduled for Friday after school. That was to be a busy week for Rhett; the end of school year was quickly approaching and many classes like Honors Biology had assignments due. Tuesday evening Rhett worked meticulously on the desert diorama for Biology which was due the following day, strategically placing the plastic cacti, and rubber snakes and spiders in the sand to resemble a desert scene. Wednesday morning May 15th, when Rhett was not awake at his typical time, my husband went to wake him. I knew something was terribly wrong when I heard his dad cry out Rhett, oh God Rhett! His training and experience as a paramedic couldnt have fully prepared him to find his son unresponsive that morning, but he told me call 911 and immediately began CPR. Less than an hour later Rhett was pounced dead at the hospital. 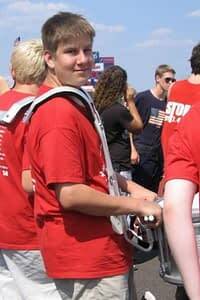 Rhett was a diligent student, interested in math, science and engineering. He loved playing video games and was intrigued by game design and animation. In addition to being a strong student, he completed his freshman year with a 4.2 GPA, he was a talented percussionist and a proud member of his high schools drum line, and a member of the boys bowling team. Rhett loved animals and had developed an interest in the political process and enjoyed debating with others. Family, friends and casual acquaintances all recognize that love and joy permeated Rhett’s life. He brought laughter to others, and possessed the ability to lift the spirits of those around him. His absence leaves emptiness in the lives of all who knew him. Like a fire that has long been extinguished, left behind are smoldering embers. As any firefighter can attest, those embers can sometimes reignite. Nothing will extinguish the smoldering embers of the grief we experience every day from Rhetts death.